Cream the butter and brown sugar with an electric mixer until smooth. Beat in the flour and salt until you have a smooth cookie dough. Divide the dough in 8. Roll one portion of the dough into a 12 inch log. Cut six 2 inch finger cookies. Place the cookies, 2 inches apart, on a cookie sheet lined with parchment paper. 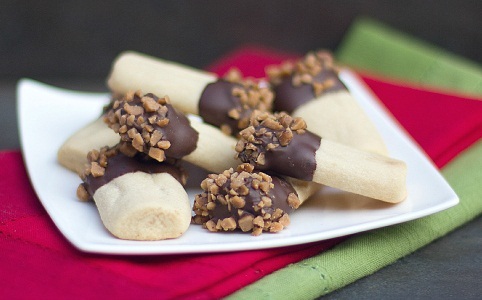 Make finger cookies with the remaining portions of dough. Bake the cookies in a 325F oven for 15 minutes or until the cookies are just starting to brown on the bottom edges. Remove them from the oven and let rest for one minute. Place the cookies on a wire rack to cool completely. Melt the chocolate in a microwave on half power. Stir until smooth. Pour the Skor bits in a small bowl and set next to the bowl of melted chocolate. Dip each cookie half way into the melted chocolate. Lift the cookie out and let any excess chocolate drip off. Dip the cookie into the Skor bits. Lay the cookie on wax paper. Move quickly or the Skor bits and chocolate may drip. Do this for all the cookies. Once the chocolate has hardened on the cookies, they can be stored. Store in an airtight container for 2-3 weeks or in the freezer for up to 3 months.